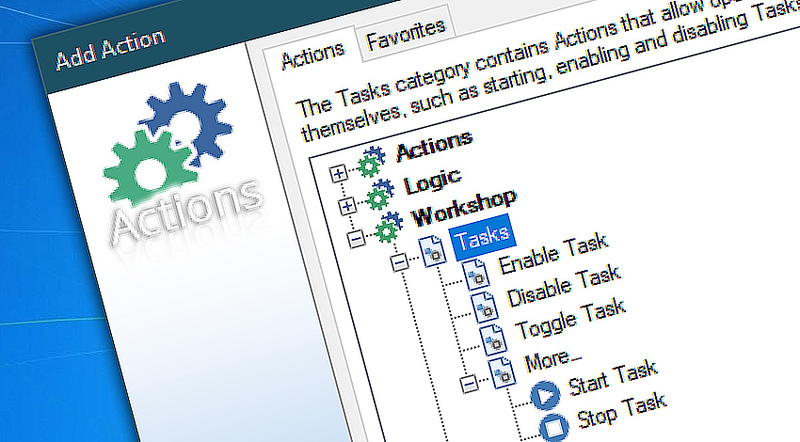 Tasks category features Actions that can operate the Tasks themselves. These actions can enable, disable or toggle a Task or group of Tasks upon occurrence of some event. If necessary, user may choose to create Task enabling and disabling sequences to address the more advanced situations that require step-by-step resolution where each step is performed by different Task. 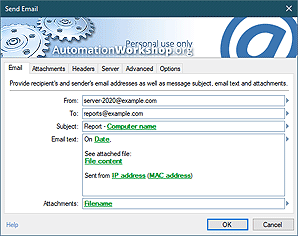 Enable Task nables one or multiple Tasks. Enabled Tasks have their Triggers monitoring the system for automatic execution. Disable Task disables one or multiple Tasks. Disabled Tasks have their Triggers disabled, so that they do not run automatically, unless started by the Start Task Action. Toggle Task enables the disabled Tasks and disables the enabled ones. Enable Task · automatically enables Tasks. Disable Task · automatically disables Tasks. Toggle Task · enables disabled Tasks and disables enabled Tasks.